Kaci Hickox, a health care worker who called her quarantine in New Jersey for Ebola concerns "completely unacceptable" after her return from Sierra Leone, plans to move back to her home state of Maine. The plan to to live in Fort Kent with her boyfriend Ted Wilbur will include an additional 21 quarantine, a protocol established by the Maine Center for Disease Control for all "higher risk" individuals, or people who have had direct contact with those infected with the Ebola virus. 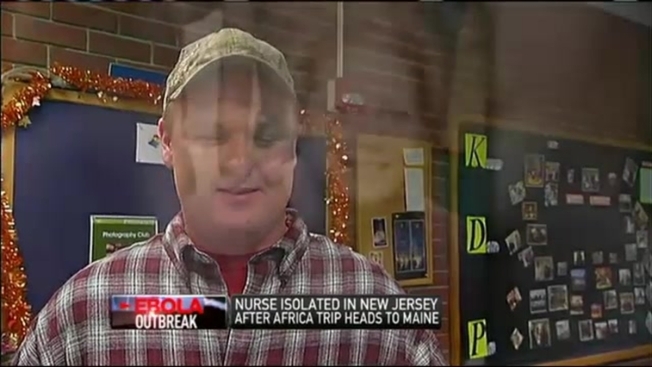 Nursing student John Wing and his fellow students at the University of Maine Fort Kent were put on notice that a fellow student, Wilbur, may soon be living off campus with a nurse who was recently treating Ebola patients in Sierra Leone. "It's kind of crazy to think this would come to Fort Kent. This is the last place I would have ever thought about," Wing said. The Maine CDC says Hickox should be quarantined at home for 21 days. The the university says if Wilbur shares a home with her during that time, he will not be permitted to set foot on campus. "We could not have him pose a risk to anyone at the institution," said Robert Dixon, the vice president of academic affairs at the university. "Even though the science of this whole thing is one aspect, we have to pay attention to the way people seem to feel about it, and we don't want hysteria on our campus." Like hospitals around the country, the Northern Maine Medical Center's entire staff has just undergone extensive Ebola training. While they don't expect an outbreak, Fort Kent says they're prepared regardless. "Our protocol has not changed at all as a result of this, but we did meet today just to confirm that everything is in place and that we were prepared, which we already were, so we're good to go," Doctor Michael Sullivan, the hospital's chief medical officer said. In various interviews, Hickox called her treatment "inhumane" after she became the first person forced into the New Jersey's mandatory quarantine, implemented by New Jersey Governor Chris Christie for people arriving at Newark Liberty International Airport from three West African countries. Officials do not know when Hickox will arrive in Fort Kent. The Maine CDC will be in charge of her quarantine, but are not releasing the details of their contact with her. The Maine CDC says all workers that spent time in West Africa are cooperating with health officials.